From a distance in the next district over, the windmill farm outside Penonome. Photo by Eric Jackson. Bill Clinton’s coming to inaugurate a windmill park — but with whom and what do we deal? Former US President Bill Clinton will be in Panama on November 10 to dedicate the next phase of a windmill park in Penonome district, east of the town of Penonome. The company involved is Union Eolica Panameña SA (UEP), which was widely reported to be a subsidiary of Spain’s Union Eolica Española back when it began to get energy generation concessions from Panama during the Martinelli administration, and is still described as such in recent reports. The several-phase windmill farm project contemplates an eventual 113 windmills that will generate about 10 percent of Panama’s electricity, depending on the season, with a greater share during dry months when the nation’s hydroelectric dams are less productive. So, who is the parent company in Spain? Actually, Union Eolica Española was dissolved in 2012. Look a bit deeper and you find it reported that a majority share — with hard to identify minority stakeholders, is now owned by InterEnergy Holdings LP, a private equity fund based in the corporate secrecy shrouds of the Cayman Islands. But we do more or less know who InterEnergy Holdings is: Rolando González Bunster, the former VP in charge of international operations for Gulf & Western Industries. The Argentine-born businessman splits his time between homes in Greenwich, Connecticut and the Dominican Republic and controls vast assets in the DR, Jamaica, the Bahamas, Argentina and Panama. He is a member of the board of directors of the Clinton Foundation. The business exec’s daughter Carolina González Bunster, who graduated from Georgetown in 2008, then went to work for Goldman Sachs in Dubai before returning to the United States to take a job with the Clinton Foundation, calls Bill Clinton a mentor. The former president attended her 2014 wedding to equity fund manager Stefano Bonfiglio at the González Bunster home in the Dominican Republic. By various accounts the Chinese company that made the windmills that are installed in Penonome, Goldwind International Holdings (HK) Limited, holds a minority stake in the project. Of the reported $564 million that has been or will be invested in the Penonome windmill park, at least $300 million comes from the International Finance Corporation (IFC), a division of the World Bank. 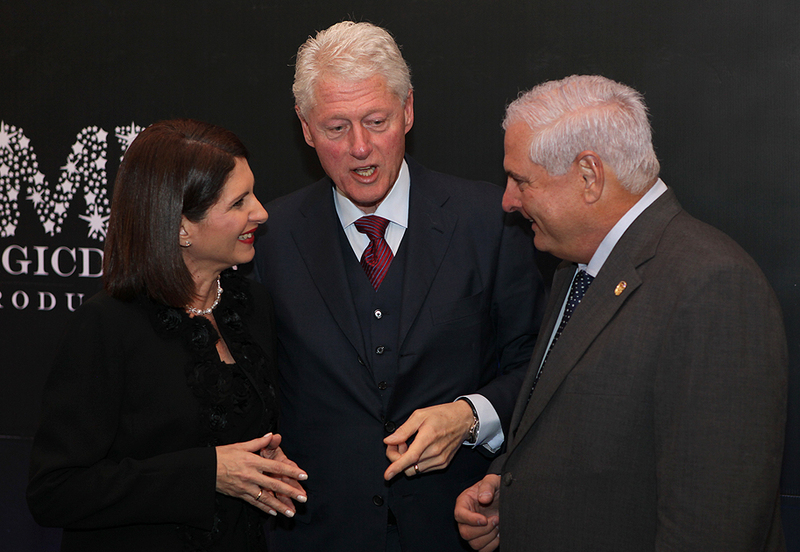 The Inter-American Development Bank, Panama’s state-owned Caja de Ahorros and Banco Nacional de Panama and several private lenders are also involved in the financing, in a deal brokered among Bill Clinton, Rolando González Bunster and Ricardo Martinelli in 2013 under the auspices of the Energy Committee of the Clinton Global Initiative. Which of the lenders is supposed to manage the disbursement of investment funds? The institution that was designated to perform that role in 2013, the New York branch of Portugal’s Banco Espirito Santo de Investimento SA, is no more. Banco Espirito Santo fell in a spectacular collapse that involved a European Union and Portuguese government bailout and sale to a new entity, and which has the bank’s former CEO Ricardo Espírito Santo Silva Salgado under house arrest awaiting trial on charges of keeping false business records, forgery of documents, breach of fiduciary duty, tax fraud, corruption of public officials and money laundering. The New York investment banking part of the business was sold off to a Chinese company, Haitong Securities. The Chinese brokerage is moving into the banking business and has a securities market presence in Panama, but it appears that its role in the Penonome windmill farm is as an arranger and bookrunner rather than a manager and that it is performing these tasks via its Brazilian subsidiary. Is there carbon credit income involved in the project? It would be surprising if there were not, but none of the parties are mentioning this in their online statements. Is this the progressive and green face of globalized capitalism, in keeping with the environmental assurances given by Washington at the time that the US Congress was persuaded by then Secretary of State Hillary Clinton and others to ratify the US-Panama Trade Promotion Agreement? Perhaps, but maybe not. This past May UEP went to Panama’s Supreme Court of Justice seeking exemption from the jurisdiction of the Ministry of the Environment. Those were the terms of its deal with the Martinelli administration, the company asserted. A decision on that claim has yet to be announced. Martinelli won’t be in Penonome for the ribbon cutting. By most accounts other than his own, he ran a grossly corrupt government between 2009 and 2014 and is facing multiple criminal charges before Panama’s Supreme Court, including for theft on a grand scale, illegal wiretapping, international insider stock trading, money laundering and other offenses. He lives in self-imposed exile in Miami.